Easter Seals has been a rewarding part of my life for several years. I have volunteered for various clean-up days, school visits, and Walk with Me Philly events. Now I am a part of the Young Philanthropist Group. The group was created to engage a diverse group of women and men between the ages of 21-40 committed to supporting Easter Seals programs through advocacy, philanthropy, and volunteerism. The members come from different backgrounds yet come together for the same cause. We are working to grow the Easter Seals brand by driving awareness among Gen X, Millenials, and Gen Z. The Young Philanthropist Group is important to me because I can share my passion for Easter Seals with other individuals who care so much to spread the great work that Easter Seals has done over the many years of service. This entry was posted in Community Partners and tagged advocacy, Easter Seals, Gen X, Gen Z, Millenilas, Walk With Me, Young Philanthropist Group on October 27, 2016 by Easterseals. This month in Bucks County we are unveiling our PBIS Staff Acknowledgement Board! 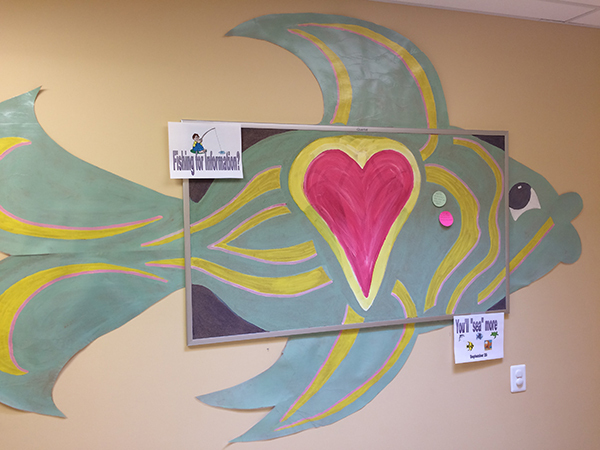 One of our very own teaching assistants designed and painted the board and fins. We polled our staff a few months ago and they chose to have a board for recognition. The purpose of the board to is highlight staff anonymously for their work with the students and with each other. We are going to highlight the actions of our staff when they are following the positive behavior principles by writing their good work on a “scale.” (Learn about PBIS here, also here, and here) Our Core Leadership Team is excited to add another exciting resource to improve our blossoming positive workplace. This entry was posted in General info and tagged Bucks County, Easter Seals of Southeastern PA, PBIS, Positive Behavioral Interventions and Supports Program, Postive Behaviors on October 13, 2016 by Easterseals.